Mt. Washington Valley Towing and Roadside Assistance has been your local provider of roadside assistance since 1976, offering professional towing as well as assistance with jumpstarts, auto breakdowns, vehicle lockouts, fuel delivery and more in Carroll County, New Hampshire, and the surrounding areas within 30 miles. It happens all the time: you run out of gas, get a flat tire or discover you’ve locked your keys in the car, and there’s no help in sight. That’s why Mt. 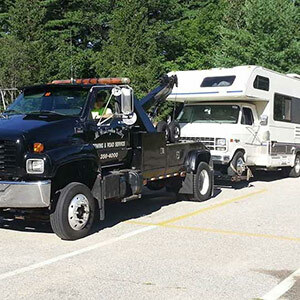 Washington Valley Towing and Roadside Assistance offers comprehensive roadside service in Carroll County, NH, and the surrounding areas within 30 miles. We are equipped to provide a wide variety of helpful services to motorists in need, from towing, jumpstarting and locksmith assistance to delivery of fuel or replacement car batteries. We are wreck master certified for your convenience. We are proud members of the New Hampshire Towing Association. We are your primary service provider for AAA in and around North Conway, NH. Our fleet of trucks is equipped for light and medium duty towing for most vehicles. We offer 24-hour emergency service for your safety.